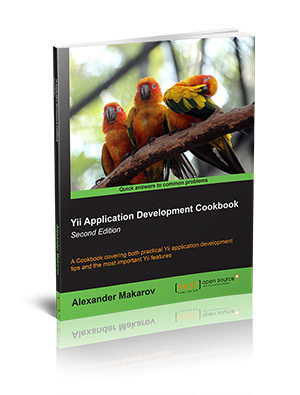 Welcome to the Yii framework recipe book companion website. Note that the book is about Yii 1.1. New book with totally new content about Yii 2.0 is OpenSource and is in the making. Start with About the Book, Foreword & Reviews	and the Table of Contents pages. Decided to buy the book? Check How to buy the book	page. If you're having a problem with any aspect of the book or want to send feedback write me a letter or leave a message at Yii framework forum.